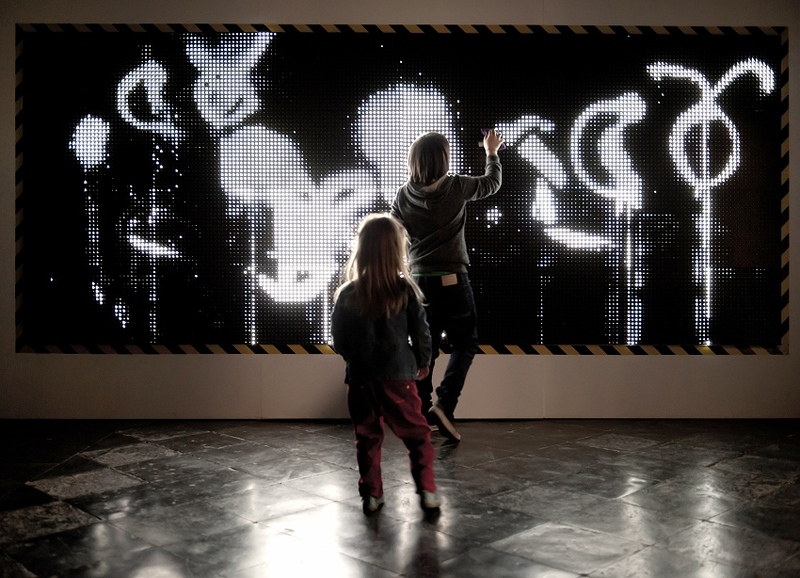 Waterlight Graffiti is a project that aims to create a high-resolution material, made of thousands of water-reactive LEDs. When applied to the frame of any individual LED, water creates an electrical bridge providing the power required to light up the LED embedded under the surface. By applying more or less water the LED varies brightness accordingly. Inspired by the idea behind the popular retro children's toy lite-brite, Waterlight Graffiti’s purpose is to be a new kind of reactive material to draw or write ephemeral messages made of light. This project enables anyone to graffiti the wall of LEDs with a basic environment-friendly atomizer. To use water, which has neither shape nor colour, to draw light, is a magical experience, regardless of the public age or its artistic sensibility. This opportunity finally becomes a new kind of interaction with urban architecture. By mixing a natural element and technology, Waterlight Graffiti’s users can even play with the weather or the evaporation speed for example. Water Light Graffiti also has a surprising role during rainy days and turn them into fireworks of damp LEDs.